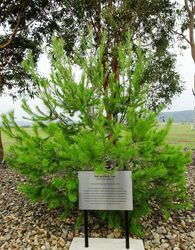 This tree was grown from seed taken from the Lone Pine at the Australian War Memorial, Canberra. 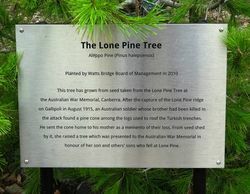 After the capture of the Lone Pine ridge on Gallipoli in August 1915, an Australian soldier whose brother had been killed in the attack found a pine cone among the logs used to roof the Turksih trenches. He sent the cone home to his mother as a memento of their loss. 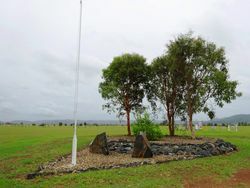 From seed shed by it, she raised a tree which was presented to the Australian War Memorial in honour of her son and other`s sons who fell at Lone Pine.